Current homeowners who may have PMI (Private Mortgage Insurance) could possibly save hundreds if not thousands of dollars over the term of their loan. This is a great opportunity for savvy homeowners to take advantage of their home’s appreciation. You may be asking, “What does this have to do with me? I’m a real estate agent or a mortgage professional.” While removing PMI may not benefit you, it could benefit your former clients. Those folks who already know you, like you and trust you. You probably already know which of your clients may have had to carry PMI. It’s a great time for real estate agents and mortgage professionals to provide ongoing value to your past clients without “selling” them anything. Call them, email them or text them, whatever you choose. Most importantly, show them that you still have their backs and that you can help them potentially remove PMI and save money. Provide value! Who knows…they may be planning to sell or refi in the near future and, now they are thinking about you. The procedure for PMI removal can vary from lender to lender. So, be sure that your client checks with their lender to obtain a set of instructions for the process. The general process for PMI removal is pretty simple. Most lenders require that a request for PMI removal be made in writing. The borrower will have to be in good standing with the lender, with no late or outstanding payments (again, this will vary). The lender will need a current appraisal completed specifically for the purpose of PMI removal (that appraisal from the refi that was done last Fall may not be acceptable). If the appraisal can demonstrate that the borrower’s home has appreciated to the required loan to value limits (check with the lender form their specific limits), PMI should be removed for the remainder of the term. If you have any questions about PMI Removal or real estate appraisals, please feel free to contact me. On January 1, 2018, The Coyle Group celebrated the beginning of our 10th year in business! We owe our success to the countless real estate agents, property owners, attorneys, banks, credit unions and mortgage professionals who have come to trust us and rely upon our services. Every day we strive to serve our clients and provide value. We appreciate your loyalty and business as we look forward to the next 10 years! Eligible properties are non-complex Single Family Dwellings located in Philadelphia, Montgomery, Bucks, Delaware & Chester Counties. The appraisal must be paid for by Check, Cash or PayPal at or prior to the time of appointment. Why do appraisers use alphanumeric Condition Ratings like C4 and C3? Why not just say “Average” or “Good”? Well, the long answer to that is there is now a thing called the Uniform Appraisal Dataset (UAD). It’s been around since 2011. It standardized the way appraisers classify the appraisal data. It was basically implemented as a way for Freddie Mac and Fannie Mae to data-mine information from appraisal reports. But that’s a discussion for another day. One of the bi-products of the UAD is the Condition Rating system. It consists of classes ranging from C1 – C6 that rate a property’s overall condition. The thought being that a property will fit neatly into one of these categories and that condition is an absolute. Prior to the UAD appraisers would classify condition using more subjective terms such as “Good”, “Average”, “Fair” and “Poor”. Granted, the definition of these terms varied from appraiser to appraiser and report to report, which wasn’t always ideal. The uniformity created by the UAD is a good thing. It basically levels the playing field and has all appraisers speaking the same “language”. Unfortunately, the rest of the real estate industry has not adopted the Condition Rating system developed by the UAD. Real estate agents, homeowners and others involved in real estate still use the old “Good”, “Average”, “Fair” and “Poor” method of describing condition. As a real estate professional, it’s worth getting to know the appraiser’s language when it comes to rating the condition of a property. Imagine showing up at an appraisal appointment and saying to the appraiser, “Hey, I’ve pulled some sales for you and they are all in C3 condition, like the subject.” From an appraiser’s point of view, your credibility just shot up and I’m going to look over your sales data more seriously. You may even want to start using the UAD condition ratings in your property descriptions. Understanding the UAD Condition Rating system isn’t hard. Here is a rundown of the classifications and the criteria for each of those classes. When you read through them you’ll see that they are pretty cut-and-dry, and that a property will typically fall nicely into one of these ratings. C1 – The improvements have been very recently constructed and have not previously been occupied. The entire structure and all components are new and the dwelling features no physical depreciation. Note: Newly constructed improvements that feature recycled materials and/or components can be considered new dwellings provided that the dwelling is placed on a 100 percent new foundation and the recycled materials and the recycled components have been rehabilitated/re-manufactured into like-new condition. Improvements that have not been previously occupied are not considered “new” if they have any significant physical depreciation (that is, newly constructed dwellings that have been vacant for an extended period of time without adequate maintenance or upkeep). C2 – The improvements feature no deferred maintenance, little or no physical depreciation, and require no repairs. Virtually all building components are new or have been recently repaired, refinished, or rehabilitated. All outdated components and finishes have been updated and/or replaced with components that meet current standards. Dwellings in this category either are almost new or have been recently completely renovated and are similar in condition to new construction. Note: The improvements represent a relatively new property that is well-maintained with no deferred maintenance and little or no physical depreciation, or an older property that has been recently completely renovated. C3 – The improvements are well-maintained and feature limited physical depreciation due to normal wear and tear. Some components, but not every major building component, may be updated or recently rehabilitated. The structure has been well-maintained. Note: The improvement is in its first-cycle of replacing short-lived building components (appliances, floor coverings, HVAC, etc.) and is being well– maintained. Its estimated effective age is less than its actual age. It also may reflect a property in which the majority of short-lived building components have been replaced but not to the level of a complete renovation. C4 – The improvements feature some minor deferred maintenance and physical deterioration due to normal wear and tear. The dwelling has been adequately maintained and requires only minimal repairs to building components/mechanical systems and cosmetic repairs. All major building components have been adequately maintained and are functionally adequate. Note: The estimated effective age may be close to or equal to its actual age. It reflects a property in which some of the short-lived building components have been replaced, and some short-lived building components are at or near the end of their physical life expectancy; however, they still function adequately. Most minor repairs have been addressed on an ongoing basis resulting in an adequately maintained property. C5 – The improvements feature obvious deferred maintenance and are in need of some significant repairs. Some building components need repairs, rehabilitation, or updating. The functional utility and overall livability are somewhat diminished due to condition, but the dwelling remains useable and functional as a residence. Note: Some significant repairs are needed to the improvements due to the lack of adequate maintenance. It reflects a property in which many of its short-lived building components are at the end of or have exceeded their physical life expectancy, but remain functional. C6 – The improvements have substantial damage or deferred maintenance with deficiencies or defects that are severe enough to affect the safety, soundness, or structural integrity of the improvements. The improvements are in need of substantial repairs and rehabilitation, including many or most major components. Note: Substantial repairs are needed to the improvements due to the lack of adequate maintenance or property damage. It reflects a property with conditions severe enough to affect the safety, soundness, or structural integrity of the improvements. If you have any questions about Condition Ratings or any other appraisal related matter, please feel free to contact us by phone, email or by visiting our FaceBook page. Each year at The Coyle Group, we work with dozens of homeowners to appeal their real estate taxes. Honestly, getting letters like this from our clients still never gets old. Here’s one where our client received a 34% reduction in their assessment. In this case that translated into an annual tax savings of $18,875!!! While results like this are not the norm, it’s nice to know that a well-prepared appraisal can help some tax payers see some pretty sweet reductions. Tax Appeal Season starts sooner than you may think. If you or your clients are thinking about appealing their tax appeal assessment, you may want to start in early Spring 2018. Filing deadlines are typically in the beginning of August but, be sure to check with your county assessors office for the exact date. Do Comps need to be within a Mile? Can you only use comparable sales that are within one mile away? Well, as most appraisal answers begin…that depends. It depends on the location of the property. Are we talking urban, suburban or rural? It depends on the type of property. Is it a 3 bedroom Twin in Roxboro or a custom-built Mansion in Bryn Mawr? In urban settings, like Philadelphia, were homes are often very similar and the housing stock is dense and sales are plentiful, it can be easy to find comparables. In situations like this an appraiser may only need to search a few blocks away to find appropriate comps. Going a mile for comparables in a place like Philly will likely put you in a completely different neighborhood, zip code and market. Unless the property is extremely unusual chances are the appraiser will be well within a mile when selecting comps. Suburban settings tend to be less built up with fewer sales. In cases like this an appraiser may have to go more than a mile for comparables. Even if they are more than a mile from the subject they may still be located in the same municipality, school district and general market place. For instance, if I appraised a house in Maple Glen and went over a mile away I could still be in Upper Dublin Township & School District and the 19002 zip code…the same general market. Appraisers have even more latitude in Rural settings. While most of my experience has been appraising in the greater Philadelphia region in an urban/suburban market, I know appraisers who do work in Rural markets. For them it’s not uncommon to go 10 or more miles away or into different counties (and states) in order to identify appropriate comparables. Think about it, the market for a 500-acre horse farm could easily span across miles, counties and state borders. Now suppose you have that custom-built Mansion that I mentioned earlier. There may not be many sales in the immediate area that would be considered comparable. An appraiser may have to go 4-5 (or more) miles away to find a suitable comparable. In cases like this it may even be appropriate to go outside Lower Merion Township (Montgomery County) into neighboring Radnor Township (Delaware County) to find comps. If the appraiser stays within an area that would be considered to be the same real estate market place*, the comparables are likely going to be appropriate. It’s also very important for the appraiser to explain their rationale for expanding the search for comparables. This is necessary to help the end user of the appraisal understand the appraiser’s reasoning and methodology. Bottom-line, there is no rule or law that compels an appraiser to select comparable no more than a mile from the subject. This is a guideline established by underwriters/lenders and has nothing to do with good appraisal practice. * A real estate market place is where forces of supply and demand operate, and where buyers and sellers interact to trade real estate for money. Market places have mechanisms or means for (1) determining price of the traded item, (2) communicating the price information, (3) facilitating deals and transactions, and (4) effecting distribution. The market for a particular property is made up of buyers who need a home and have the ability and willingness to pay for it. Hey, I know it’s kind of last-minute but, if you or your clients live in Montgomery, Bucks, Chester or Delaware County you have until the end of business August 1, 2015 to file the paperwork for your tax assessment appeal. If you live in the City of Philadelphia you have until Monday, October 5, 2015 to file your appeal. This is a great way to reduce your tax burden. It typically involves filing the necessary paperwork with the county assessors office along with a fee. You should check with your county assessors office to find out what the exact fee may be. After that, if you live in the Counties, you will receive a hearing date at which time you will be able to plead your case in front of the Board of Assessment (please note that Philadelphia works a little differently, go figure). You will want to take with you any evidence, photos or data that would demonstrate that your property is over-assessed (MLS Sheets will usually not cut it) . The most effective way to illustrate your case to the board is with a current appraisal of your property showing that the value is less that implied assessment value and they you deserve relief. Now, some folks represent themselves at the hearing, others hire attorneys to handle their case. Either way the burden of proof is on the property owner. Real Estate Agents: this is a great way for you to reconnect with past clients by offering them professional assistance without trying to sell. Imagine how happy our past client would be if you were able to help them save hundreds or thousands of dollars off their tax bills each year! If you have any questions or if we can help you or your clients determine if an appeal is reasonable, feel free to contact our office before the deadline. We can also help you with an appraisal of the property prior to the hearing. Good luck!! It’s been a pretty busy 2015 and I really haven’t had much time to blog. However, this is probably my favorite post to write each year. Since 2011, we’ve had a little contest between Zillow and The Coyle Group (see prior years). We randomly select a number of appraisals recently completed by our office and see how our appraisal values match up against Zillow’s Zestimates. This year we chose 16 properties across Philadelphia, Montgomery County, Bucks County, Delaware County and Chester County. Housing styles ranged from Roxborough rows to Center City condos flats to Main Line mansions. Below is a chart of the results. The first column shows where the property is located, the second The Coyle Group’s appraised value and the third Zillow’s Zestimate. The last column shows how high or low Zillow was relative to our appraised values. Once again, the results are pretty astonishing. Now, Zillow was pretty accurate on the Ambler Golf Community home; and the Merion Station Tudor was right on target. I’ll even concede that the Center City Condo was in range as well. But when Zillow is off, it tends to be way off! For instance, with the Parkwood Row in Northeast Philly, Zillow understated the value by 34.62%. That’s a big miss considering how “data rich” the Northeast is. Also, it just so happens that this property is currently active for $190,000. Zillow missed that little fact. This is where having a human being analyze the market data is so important. Another interesting example is the Wyndmoor Colonial. This property was over valued by more than 22%. You see, what Zillow didn’t know was that this property was in original condition. Original kitchen, baths, fixtures, shag carpeting, wallpaper, etc. It was like stepping back into the 1960’s. Again, this is where having a certified appraiser physically inspect the property really matters. Algorithms don’t differentiate between “Brady Bunch chic” and a knocked-out kitchen with granite and high-end stainless appliances. It just so happened that only four of the sample properties were under stated by Zillow. Granted, is a very small sample but, on average the Zestimates were under the appraised value by 22.98%. This is important to consider. If you are a homeowner selling your property and relied on a Zestimate to price your home, you could potentially under-price your house and leave some serious money on the table. The other twelve value samples are all over-stated by an average of 8.83%. As a seller, if you over price your home in a competitive market, buyers will pass you by in favor of more competitively priced homes. Eventually, you’ll probably have to lower your price and run the risk of losing buyers that may have otherwise been very interested in your home. Philadelphia and the surrounding markets are so nuanced that computers and algorithms can’t accurately take into account all of the individual market factors. For instance, things like specific location can’t be accounted for by Zillow. If your home is next to a garbage dump Zillow will look at it the same as if it were next to a park. As pointed out above, Zillow also has trouble factoring condition and updates into their Zestimates, as well. As of right now, there is no technology that beats having a knowledgeable appraiser to determine an accurate value on a property. Granted, the technology is getting better, quickly but it’s still not as reliable. Don’t get me wrong, Zillow has it’s place. It’s great for gathering information on neighborhoods and general market trends. It’s comparative tools and graphs are very useful. Zillow is a good place to start. However, in the end, Zillow’s Zestimates are not appraisals at all and should not be relied on as such. If you need assistance in pricing a property, I suggest getting some input from a from a good local agent or a certified appraiser and passing on Zillow. Is a BPO the Same as a Professional Appraisal? BPO’s, otherwise known as ‘broker price opinions’ are often used by lending institutions to obtain the current market value of distressed properties including short sales and foreclosures. In addition, brokers and realtors often use BPO’s to help justify a suggested list price for those looking to sell their home. BPO appraisals are NOT completed by professional real estate appraisers and instead, are usually completed by real estate brokers and are far less detailed than that of a professional appraisal completed by a professional real estate appraiser. Depending on the type of information required, brokers may provide either a drive-by or internal BPO. Drive-by BPO’s are often used for properties that have gone into foreclosure as they allow brokers to gather enough information without having to contact or dialogue with the foreclosed property owners. Internal BPO’s require more detailed information on the property which can only be obtained by gaining interior access to the property. Internal BPO’s are often used for homeowners involved in a mortgage refinance, loan modification, or short sale. During an internal inspection brokers gather information about a property’s interior and exterior condition allowing them to more accurately report gross living area, condition of the ceiling, walls, flooring, mechanical systems, countertops, sinks, tubs, fencing, roofing, siding, swimming pools, and more. Both internal and drive-by BPO reports include year built, lot size, gross living area, number of rooms, property condition, information pertaining to the immediate neighborhood, and often additional information regarding the number of homes listed for sale or rent in the area. BPO’s and their subsequent property value assessments often require listing the total number of foreclosure properties within a 5-mile radius because when a high number of foreclosed homes are present, most often property values of all homes in the area decline. In short sale situations, accurate BPO appraisals have often been known to reduce principal loan balances by as much as 15-25%. While this amount is substantial for mortgage lenders it’s still more cost-effective than going through the process of foreclosure. One important note is that the ‘The Dodd-Frank Wall Street Reform & Consumer Protection Act’ prohibits BPO appraisals from being used as the primary basis for determining property value when real estate is used as collateral to secure the loan. So in any situation, it is always best to consult with an attorney or real estate broker to ensure a BPO is legal and acceptable in your case, as your situation may require a more detailed appraisal performed by a professional state certified real estate appraiser. I hope you found this helpful and if you have any additional questions, thoughts, or comments please leave them down below. The Coyle Group, LLC is one of the most well-respected and sought after appraisal firms in the greater Philadelphia area specializing in residential and commercial appraisals for divorce, bankruptcy, estate, date of death, tax appeals, pre-listings, and more. For more info contact us at 215-836-5500, http://www.thecoylegroupllc.com, or email us at appraisals@coyleappraisals.com. 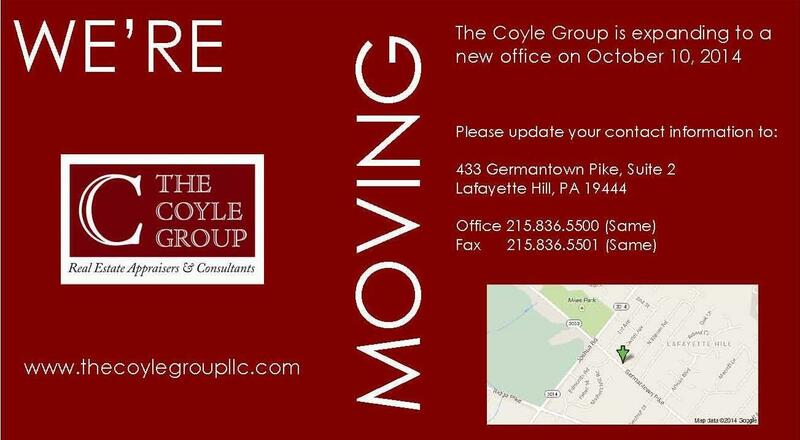 The Coyle Group is pleased to announce that on October 10, 2014 we will be expanding to a new office. We will be moving to 433 Germantown Pike, Lafayette Hill, PA 19444. Only our address will change. You will find the same great people and service at the new location. Even our Phone and Fax numbers will be the same. Join us in celebrating! We look forward to assisting you our clients and friends at our new location for years to come! Click below for our Moving Notice and map.